This is an interesting story about the origins of 'Maneki Neko' or the Japanese Lucky Cat (aka Beckoning Cat, Money Cat, or Fortune Cat). We lived in Japan for four years and the cats are ubiquitous there. I never really knew anything about the origins of the talisman, but I knew the figurines were considered lucky and were often seen in restaurants and stores. You can find out more at the Wikipedia page here. From what I can tell, the story in this book is not an original tale, but it certainly is an unusual story. The beginning is quite sad and we were a bit surprised, but the story ends on a positive note. The illustrations are colorful and complement the story nicely. The copy of the book we borrowed is a Vietnamese/English Bilingual edition. Overall, we really enjoyed reading this story together. We also have the book Maneki Neko: The Tale Of The Beckoning Cat and The Beckoning Cat: Based on a Japanese Folktale on hold at our local library and we are looking forward to comparing the stories. A cute story about a boy and his journey in becoming a maker of Lucky Cat figurines. Had to get this book from the library because Phoenix was going to be performing this book on stage at our local cherry blossom festival with the author of the book! It's a great book. 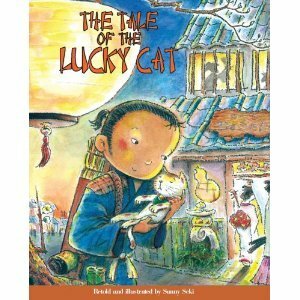 It is a very interesting story of how the spirit of a dead cat brings good luck to the boy who tried to help him. The illustrations are beautiful! Also, it is written in both English and Spanish. Excellent book to read to young kids as it promote good moral values. Great to have an open discussion on acts of kindness to animals and the benefits of doing good deeds.